August 194E and February 194P. Since 1920, the) were also above parity in 1924-2.5.
and demand have been very large. areas, climatic and soil conditions are especially suitable for large-scale wheat production. In 1946-48 the United States was the world's largest wheat producer, with China second, the U.S.S.R.
are still large enough to require acreage allotments for the 1950 crop. slightly larger than that on July 1, 1949.
carry-overs of 631 million bushels in 1942 and 619 million in 1943. July 1, 1949 account for total 1948-49 supplies of 1,485 million bushels. Wheat exports set a new high record for the fourth consecutive year. Kansas City dropped to $1.85 on July 2, or 35 cents under the loan rate. Since then, prices have strengthened and on July 25 were up to $1.99. grain in the European parts of the country. Council was held in Washington on July 5.
in the size of the carry-over on July 1, 1948.
at the end of this period were much larger than at the beginning. "ports, including shipments under various foreign ai t program, . became the most important price-factor. countries, and the continued rise in the general price level. are about the same as the 1,484 million bushels in 1948.
seed. In addition, shipments to Territories will be about 4 million. distilled spirits, alcohol and malt beverages continues unimportant. continue to be very important. 20 percent more than the average of 992 million bushels. This is 13 per- . .148 million bushels below June 1 prospects. .M fo'.w. : Winter 15.2 (15.2), durum 13.4 (14.1), other spring "
is a hew record high for the fourth consecutive year. movement for hard winter passed and did not overburden facilities. tl.9 up to 14 cents. available and the movement to market has been heavier and prices weaker. The price of spring wheat at Minneapolis is still above the loan. S about as large as last year even with a crop 100 million bushels smaller. be wheat produced in the continental United States in 1949, grading U. S.
tional month. Loans will mature April 30, 1950, or earlie-' on demand. quantity of eligible wheat upon which he desires an option to deliver to CCC. by CCC will be the same as the loan delivery rates. 2 245 percent. The resulting parity is $2.17. proclamation of wheat marketing quotas is required. lion acres the announced national acreage allotment. farm's share of the total national allotment. because of the war emergency before a referendum was held. it was suspended because of the war emergency. 150, seed 80, and exports 450). trih their allotments will be entitled to price support. and other measures succeed in adjusting production,"
lion pounds, was filled by Juno 6 for the quota year ending Mlay 28,' 1950.
bushels of wheat and 4,0 million pounds of flour during any" quota yoar. Imports of vhoat and flour in the past few years have boon small. as feed to supplement cur domestic feed grain supplies which h i.ore inado. 16 percent less than the 1935-59 average of 658 million bushols. i ~~~~~~~~ a.u:. :".,'. . -.. :, .. .. .. ". :.. 0- "" -" .":. .... .". 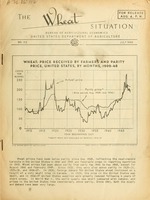 wheat production was 17 percent below prewar. rains delayed harve3clng in some southern areas. The cool and rainy weather. but with a reduced acreage, prospects are for a substantially smaller crop. durinL Ji'na and early Ji.ly was reported to have reduced the brop. pects arc somewhat abovo average. a very good grain harvest is underway. good crop is being turned out in spite or earlier reports of' drought. July 21 at 27.5 million acres, an increase of 14 percent from the 24.1 mil-. for largely by adverse moisture conditions. Silncrease their wheat acreage, now being seeded, to about 17 million acres. S'wheat in Argentina this year. 3i." 13.0 million acres seeded last year or the 13.1 million average in 1935-39.
still well above the average of 170 million bushels for 1935-39. The International Wheat Council, created under the International. to exporting countries at equitable and stable prices." ment and therefore declared the International Wheat Agreement to be in effect. SThe' parliaments of most of these nations have not been in session since the .
.:agreement was drawn up. Most of them are still expected to ratify. |i not sign, by a two-thirds vote of the exporters and importers voting separately. 3. Voted to make London the permanent seat of the Wheat Council. iCommerde and Agriculture of the Australian Government. Egypt, India, Italy, Union of South Africa, and the United Kingdom. relationship between different grades and qualities of wheat and flour and on;'. relative prices of wheat in different parts of the world. Council and the Executive Committee. opportunity to ratify the Agreement. Executive Committee, and the Secretarilt. reported by the Commodity Credit Corporation. Stocks in the other three positions! are estimated by the Crop Reporting Board. valorem on "wheat unfit for human consumption." 3/,eneral imports prior to July 1934, subsequently imports for consumption. 1936 : 94.1 104.8 104.3 106.8 106.4 114.5 123.6 124.9 123.2 126.6 118.3 108.9 102.0. 1941 : 85.6 88.5. 95.8 91.0 93.4 102.2 106.1 104.9 105.1 99.7 99.8 95.7- 93.9. S 3Beginning 1938 includes unredeemed loans at average loan value. l for June 1949-88.4 x 2.45=2.17. .. .
..- _t" :::: 4:. ... .. :::. [""..
2.62 2.29 2.28 1.81 2.27 2.05.
payment o0 pu 4. ng So. specified markets and dates, 1943-49 .